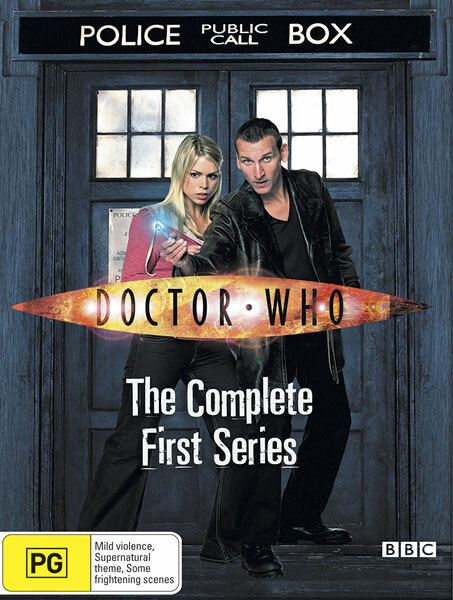 Note: Contains all 13 episodes of the 2005 series in a 5 disc box set, including an entire disc of extras not present on the earlier series 1 DVDs. Note: Region 1. 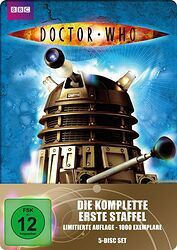 The first (and so far only) Doctor Who video or DVD to be released separately in Canada — this was due to the new series being broadcast much sooner in Canada than the US. The identical US release followed 5 months later. 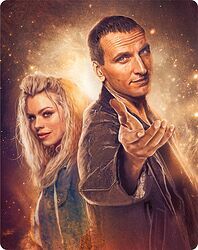 Doctor Who est en apparence un homme dynamique, courageux et drôle. Un homme tout à fait ordinaire, à ce détail près qu'il parcourt l'espace et le temps à bord de son vaisseau, le TARDIS, réglant toutes sortes de problèmes, combattant des monstres tous plus hideux et machiavéliques les uns que les autres, et sauvant au passage la Terre à plusieurs reprises. 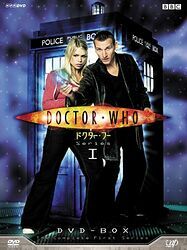 "Doctor Who" est un véritable institution en Grande-Bretagne, à l'image de la série "Le Prisonnier" ou encore de "Chapeau melon et bottes de cuir". 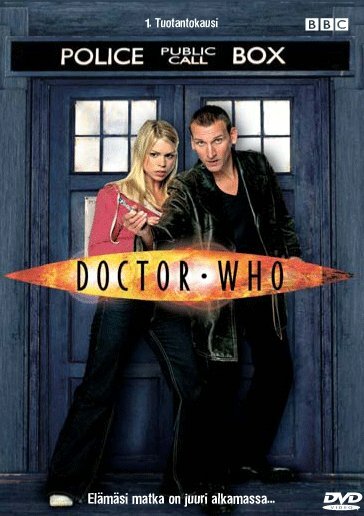 Créé en 1963 par Sydney Newman, "Doctor Who" est la série de science-fiction la plus longue de l'histoire de la télévision britannique avec plus de six cents épisodes et deux films de cinéma. Rough English translation as follows. Note: in French, the title of "The Avengers" is literally translated to "Bowler Hat & Leather Boots"! 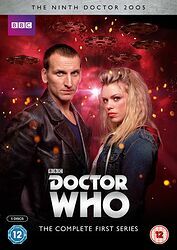 Doctor Who is seemingly a dynamic man, courageous and funny. 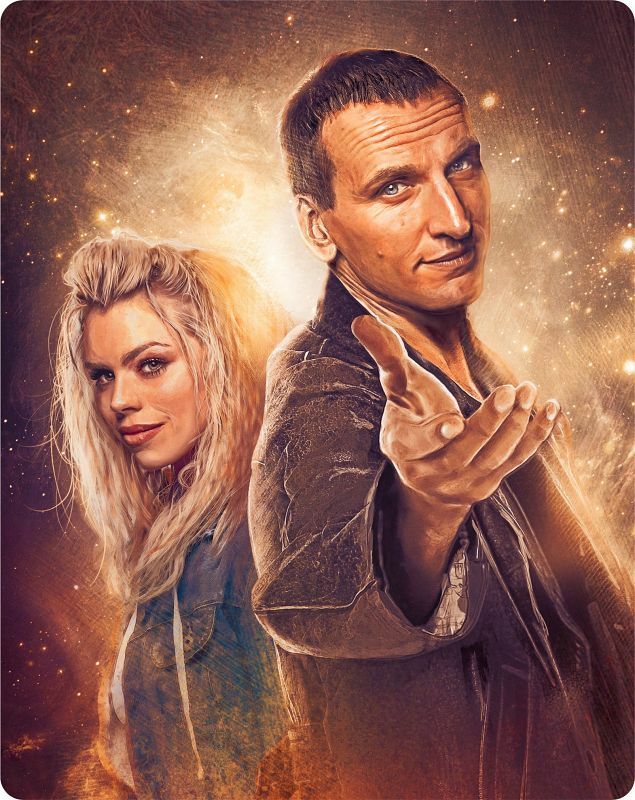 A quite ordinary man, except that he travels space and time aboard his vessel, the TARDIS, solving all sorts of problems, fighting monsters each more hideous and Machiavellian than the last, and in the process saving the Earth multiple times. 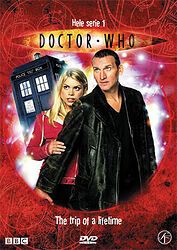 "Doctor Who" is a veritable institution in Great Britain, similar to "The Prisoner" or "The Avengers". Created in 1963 by Sydney Newman, "Doctor Who" is the longest sci-fi series in the history of British television with over six hundred episodes and two movies. Note: Exact release date unknown. 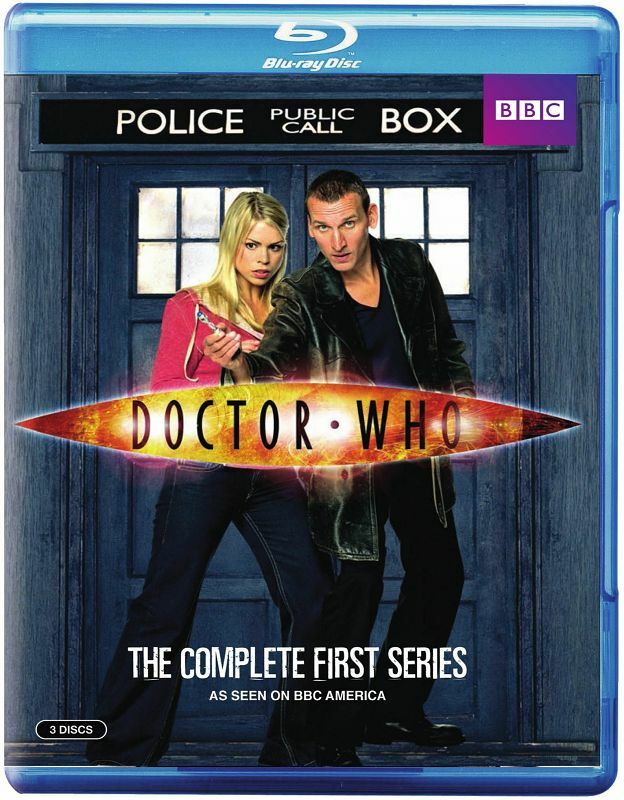 As stock of the original "TARDIS box" packaging sold out, they were replaced with this slimmer Digipak-style wallet, similar to the US release. This change is believed to have been driven by complaints from fans & retailers, who found the original packaging design too bulky and flimsy. Nearly 5 hours of special features! Note: Region 3 / NTSC box set. 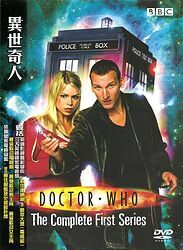 Original English audio is used throughout, with a choice of Cantonese or English subtitles. The packaging states "For sale in Hong Kong and Macau only". Note: Contains a choice of English or Italian audio, plus Italian or English subtitles. La popolare serie televisiva britannica che narra le avventure di un viaggiatore del tempo noto con il nome di "il Dottore". 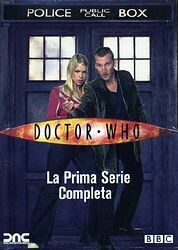 È accompagnato nel suo girovagare per le ere dalla giovane Rose Tyler. Tra guerre nucleari, navi spaziali precipitate sulla Terra e tentativi di diffusione di virus, il Dottore e Rose dovranno cercare in tutti i modi di salvare l'Universo da terribili nemici. 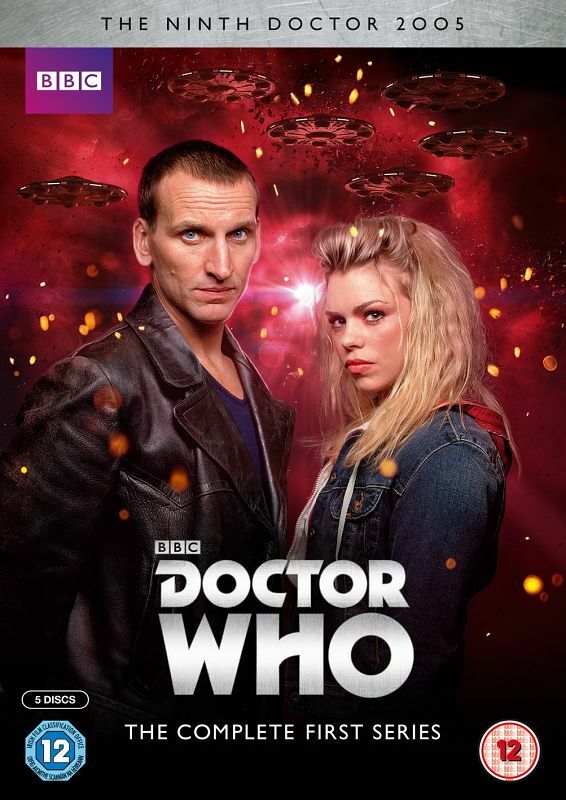 Nei panni del Dottore CHRISTOPHER ECCLESTON (The Others; G.I. Joe - La nascita dei Cobra) con lui la bella BILLIE PIPER (Evita). 4 DISCHI PER PIÙ DI 9 ORE DI AVVENTURE OLTRE IL TEMPO E LO SPAZIO. The following is the Danish text from the back cover. If there are any Danish speakers in the audience, please send me a translation! Oplev den nye Doktor i skikkelse af Christopher Eccleston. 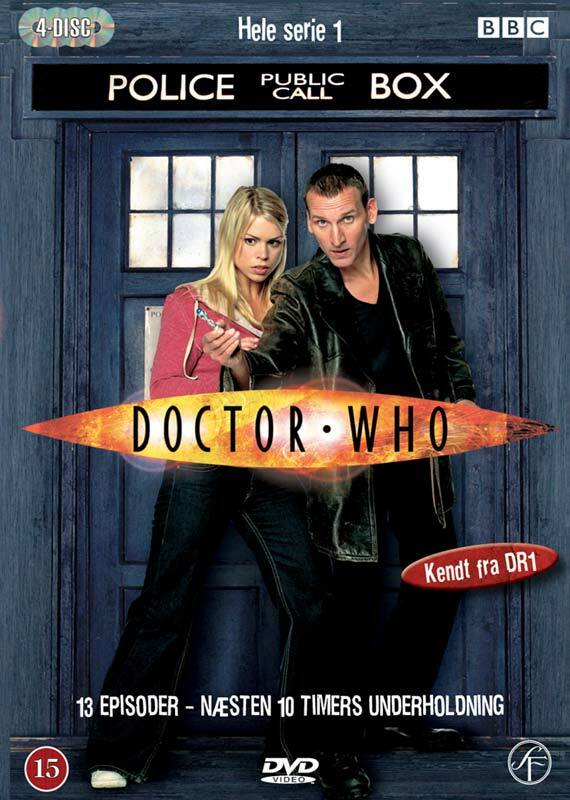 Doctor Who er en kendt kult Tv-serie, som tog sin begyndelse i 60'erne. Rose Tyler, en ung butiksmedarbejder fra London, lever et kedeligt og helt almindeligt liv indtil manequindukkerne i varehuset bliver levende og prøver at dræbe hende. En mærkelig mand, som kalder sig "Doktoren", redder hende. Og snart er hun med doktoren på eventyr. Dette inkluderer rejser både frem og tilbake i tiden, i et forsøg på at redde verden fra rumvæsner, som vil have verdensherredømmet. Note: English audio with Dutch subtitles. Maak kennis met de nieuwe Doctor en zijn metgezel Rose. Samen reizen zij door ruimte en tijd in een reeks spannende avonturen met dodelijke confrontaties. Rose Tyler on myyjätyttö Lontoosta, joka elää verrattaen tavanomaista elämää. Kaikki muuttuu, kun sovitusnukke hyökkää äkkiarvaamatta hänen kimppuunsa tavaratalossa. Doctor Who pelastaa hänet oudon hyökkääjän kynsistä. Pian Rose huomaa matkaavansa avaruudessa eri planeetoilla ja galakseissa. Aikamatkailun lisäksi hän joutuu taistelemaan maapallon herruudesta avaruusolioita vastaan mitä eriskummallisin keinoin. Note: Contains Japanese dubbed audio. 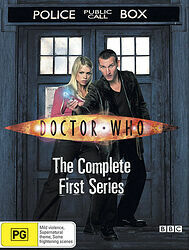 This box set contains 4 discs, not 5: Instead of a separate disc containing the full series of Doctor Who Confidential, a small selection of Confidential episodes are spread around the other 4 discs. 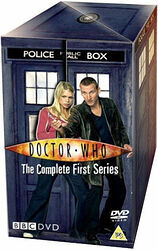 Also, this box set includes The Christmas Invasion, which in other countries is part of the Series 2 box set instead. The following is the Swedish text from the back cover. If there are any Swedish speakers in the audience, please send me a translation! 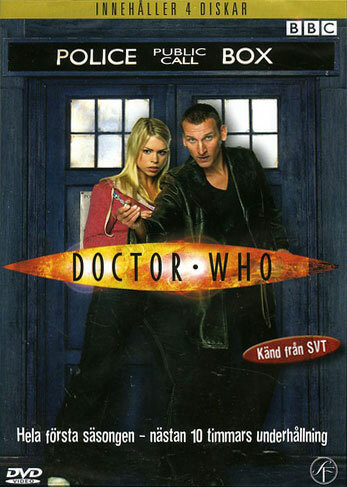 Den prisbelönade skådespelaren Christopher Eccleston har axlat rollen som den nionde doktorn från yttre rymden. Han är en modig ensamvarg med sinne för humor och enastående finurlighet. Doktorns kamp mot onda rymdvarelser tar honom och hans följeslagare Rose på resor genom tid och rum. Rose är en ung tjej från nutida London som fram till sitt möte med doktorn genomlider en trist vardag som butiksbiträde. Från allra första stund inser Rose och doktorn att de är själsfränder. Utan att tveka överger hon sitt jordeliv för doktorns löfte om fantastiska äventyr över hela universum. Tillsammans hindrar de rymdvarelser från att ta över jorden, de bevittnar jordens undergång flera miljoner år fram i tiden, de möter Charles Dickens och Rose får chansen att återse sin döde far. Men när doktorn ställs ansikte mot ansikte med den fiende som han sedan länge trott var besegrad, hotas både Rose och hela mänskligheten av förintelse. Kommer doktorn att kunna stoppa sin mest fruktade fiende — Dalekerna? Note: Choice of Spanish, Catalan or English audio with optional Spanish or English subtitles. Re-released in June 2013. Dr. Who gira en torno a un extravagante personaje, del que desconocemos sus orígenes, capaz de viajar a través del tiempo y el espacio. 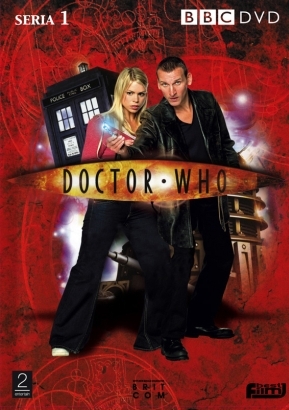 En cada uno de sus viajes descubre nuevas sorpresas y fascinantes aventuras, que comparte con su compañera, Rose Tyler, y una serie de alienígenas y monstruos perdidos en la tercera dimensión del espacio estelar que se prolonga más allá del tiempo y de nuestra galaxia. En sus idas y venidas, el protagonista de la serie cuenta también con unos enemigos permanentes: los malvados Daleks, capaces de todo tipo de fechorías y una amenaza constante para el futuro del hombre. Note: Exclusive to French retailer Fnac initially — the release date for other retailers was 11th July 2012. Note: Region 4 DVD. Choice of English or Portuguese audio, with optional Portuguese subtitles. Note: Re-released in August 2017. Note: Re-released in June 2017. 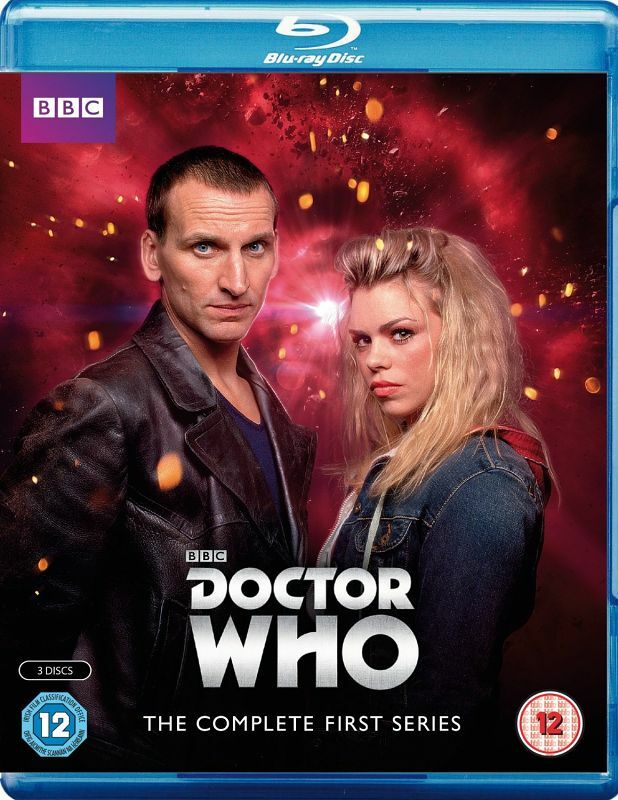 Note: This was the first standalone UK release for Series 1 on Blu-ray — it was previously only available on The Complete Series 1-7 box set in 2013. 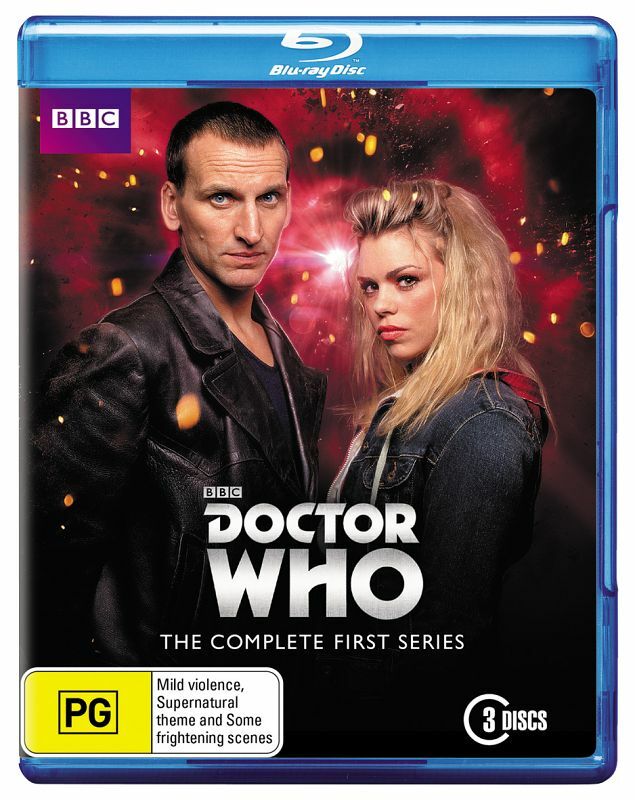 Standalone Blu-ray releases of Series 2, 3 and 4 were made available at the same time. 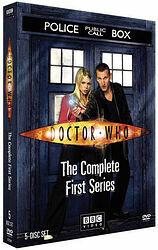 All these releases had their resolution up-converted for Blu-ray since Series 1-4 were not originally filmed in HD. 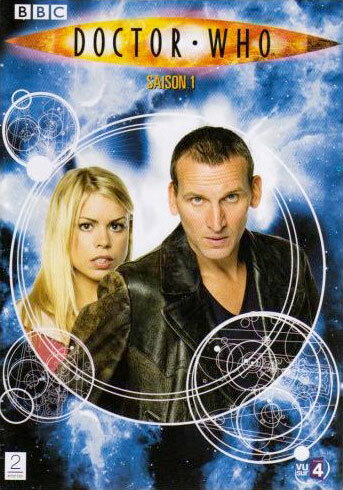 Note: Similar to the UK Blu-ray release above, this was the first standalone US release for Series 1 on Blu-ray — it was previously only available on The Complete Series 1-7 box set in 2013. Exclusively available in Best Buy 2 months ahead of the general release date. Some copies came with a set of 3 exclusive Topps trading cards (featuring The Doctor, Rose and Captain Jack). Note: Amazon exclusive in "steelbook" packaging. Note: Steelbook edition, limited to 1,000 copies. 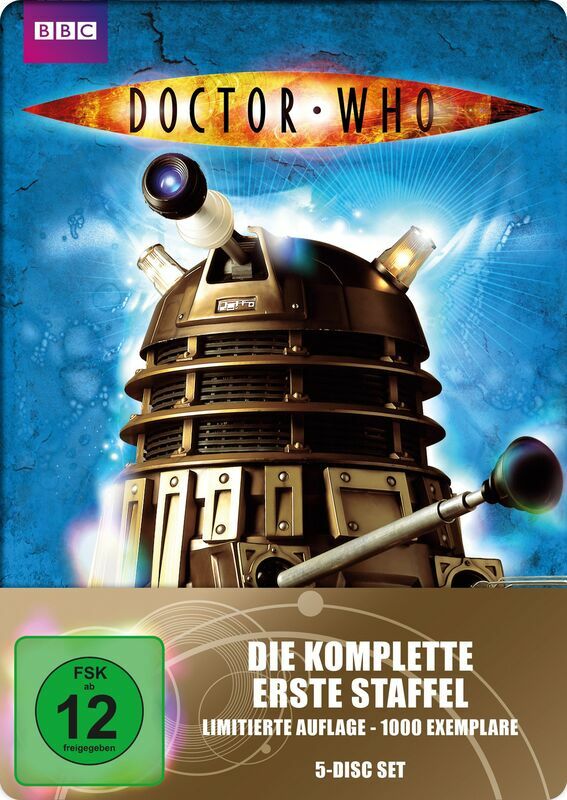 A German steelbook edition of Series 2 is also being released simultaneously.